Animal Empire - Start your adventure today and rescue all animals of the Funny Islands. 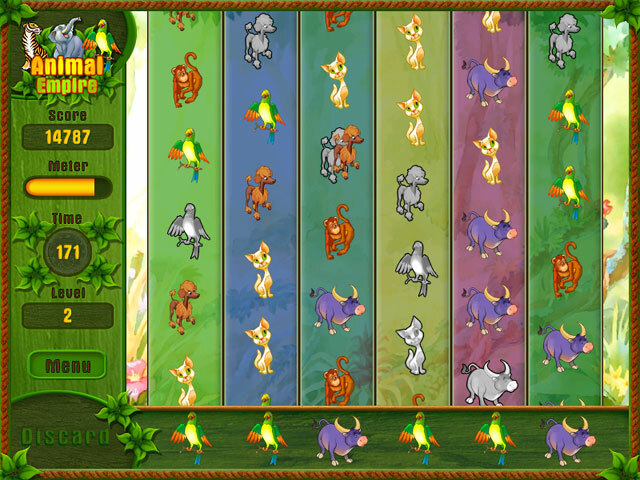 Drag animals into matching slots. Fill Out the screen before time runs out. Enjoy beautiful hand rendered graphics, two exciting game modes, and great fun! Game Features: 132 levels total; Cute animals; Hand rendered graphics; Two exciting game modes; Calm music; Addictive game-play. An extremely challenging Breakout game. National Geographic: Animals Screensaver is a beautiful screensaver for free. You castle is under constant attack from specially trained battle animals. Qweas is providing links to Animal Empire 2.0.0 as a courtesy, and makes no representations regarding Animal Empire or any other applications or any information related thereto. Any questions, complaints or claims regarding this application Animal Empire 2.0.0 must be directed to the appropriate software vendor. You may click the publisher link of Animal Empire on the top of this page to get more details about the vendor.